Both Franklin and Eleanor Roosevelt were avid readers. With this postcard, the future president orders three books from Pierce & Scopes, Booksellers and Importers, in Albany, New York. FRANKLIN D. ROOSEVELT. 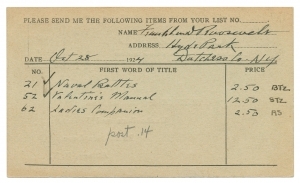 Autograph Notes filling out bookseller’s printed postcard order form, October 28, 1924, 1 p.
The Roosevelt Library has American Naval Battles, published between 1831 and 1848, as well as Edward Shippen, Naval Battles, Ancient and Modern (1883); Harry Parker, Naval Battles from the Collection of Prints Formed and Owned by Commander Sir Charles Leopold Cust, Bart. (1911); Charles Elkins, The Naval Battles of Great Britain (1828); three copies of The Naval Battles of the United States in the Different Wars with Foreign Nations (1857-1859); and Edward Kirk Rawson, Twenty Famous Naval Battles (1899). Autograph Notes “Valentine’s Manual 12.50,” likely Henry Collins Brown, Valentine’s Manual of Old New York. Henry Collins Brown (1862-1961) was born in Scotland and came to New York in 1875. He became a historian, author, and lecturer, and founded the Museum of the City of New York in 1923. He wrote several books on the history of New York and edited Valentine’s Manual, an annual publication, from 1917 to 1928. Brown’s publication continued a series called the Manual of the Corporation of the City of New York, published in 28 issues between 1841 and 1870. “Ladies Companion 2.50,” likely The Ladies’ Companion, and Literary Expositor. William W. Snowden published The Ladies’ Companion, a Monthly Magazine; Devoted to Literature and the Fine Arts in New York from 1834 to 1844 in 21 volumes.